The TSP-L10 series from Star comprises high speed lottery ticket printers. With up to 300mm/sec. they are the right answer to long waiting lines at the ticket counter. This means, up to 100 tickets can be printed in just under two minutes. The printers produce lottery tickets, tickets and coupons up to a maximum width of 82.5 mm cleanly and highly reliably. Graphics are printed with high quality, with 203 dpi, to ensure for professional looking results. With the printers of the TSP-L10 series you can be sure that only tickets with secure barcode readability will be printed. Optionally integrated is also a ticket scanner for authentication checks TSP-L11. 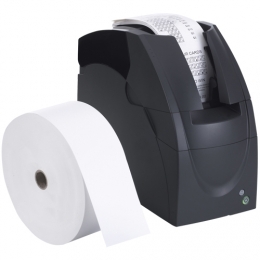 The practical receipt memory can handle up to 100 tickets, and the small housing accommodates paper rolls up to 20 cm in diameter. This reduces the number of roll changes dramatically, and increases operating time. Connect the printers to an existing network easily via Ethernet. As an alternative, the dual interface also offers a USB interface. Linux drivers are available standard for the series.